Since the 2017 flooding and hurricanes, residents have had to quickly contend with the need to become acquainted with confusing insurance jargon, along with the reality that their premiums had skyrocketed. The answer to whether persons should continue to insure was a no-brainer since insurance in many cases, it was a mandatory requirement by governmental and lending institutions; other persons readily recognised that the potential risk of future damage to assets outweighed thoughts of boycotting the insurance rat race. Key personnel at MONEY MATTERS describe the event is a prime opportunity for residents to voice their qualms about how rising insurance premiums have impacted them, their families and businesses, and for them to recommend solutions for pacing inevitable increases in insurance premiums. 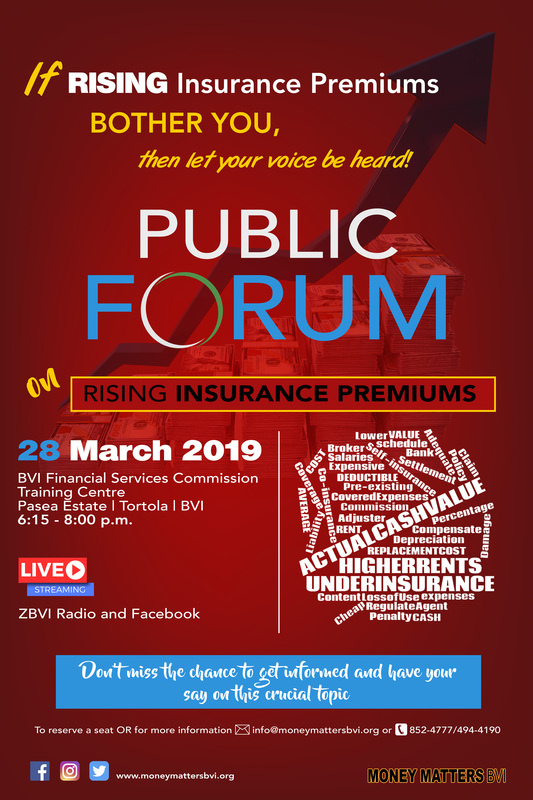 Presenters at the forum will be Acting Director of the Insurance Division at BVIFSC, Ms. Trevecca Hodge; General Manager of Colonial Insurance (BVI) Ltd., Ms. Kishma Baronville; and BVI Chamber of Commerce and Hotel Association, Mr. Colin O’Neal. They will give an overview of Insurance, discuss how insurance premiums are determined, why premiums are on the rise, the effects of premium hikes on families and businesses, and why deliberate underinsurance is not a recommended response. The public will be given the opportunity to ask questions and give commentary after each presentation. The insurance Regulator will also be on hand to sum up with the response of ‘What’s Next from the Insurance Regulator’s Standpoint’. Interested members of the public are encouraged to email info@moneymattersbvi.org or call 494-4190 or 852-4777 early to reserve seating. Light refreshments will also be provided after the Forum. The event will be streamed live via Facebook at @MoneyMattersBVI and on ZBVI Radio where members of the public who can’t physically attend, are encouraged to tune in and join the conversation.